I did a little dance this weekend at the Virginia Park farmers' market here in Santa Monica. Okay, a big dance. A really big dance. Because the cherries are back, baby! This is a huge event in my house. By this time of year my kids are sick sick SICK of citrus, apples, and the occasional kiwi. They are craving summer fruit: golden yellow apricots, sweet-sour plums, sugary pluots, crisp-sweet peaches and nectarines (yes, I know, it's weird, we like our peaches and nectarines hard and crunchy). Southern California cherries are the first local stone fruit to show up in the spring. Now we know for sure that apricots and the early nectarines are only a few short weeks away. So long, apples, we'll see you in the fall - I mean, we love you, apples, really we do, but don't you feel like we could use a few months apart to appreciate each other properly? Last year on Father's Day, the kids and I let their dad sleep in and went to pick cherries in Leona Valley with my friend Carolin and her boys - these are Carolin's fabulous photos, by the way. Leona Valley is a sweet crevice in the high desert near Palmdale, with dry, sandy hills on all sides. Some farmers in the early 20th century figured out that cherries would grow well there and planted acres and acres of trees. 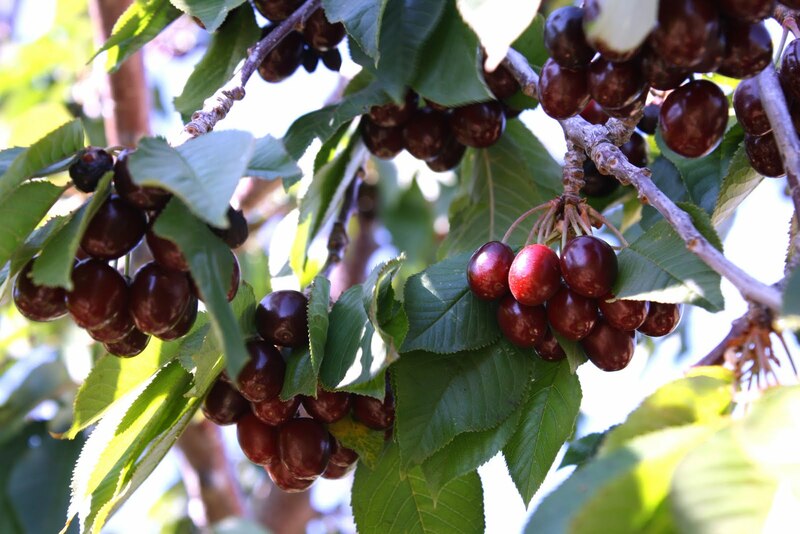 Now every June, you can drive into one of the many pick-your-own orchards and tromp around among the trees, filling buckets with beautiful yellow and red cherries. We picked, oh, let's see, about five gallons that day. At least. And then we came home and made cherry cobbler to celebrate the two dads. 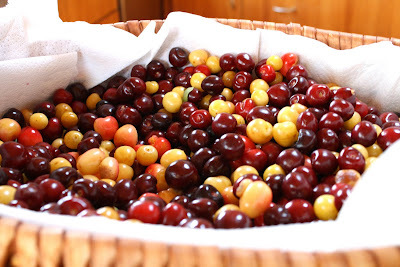 When other kids come over to our house during cherry season, my boys introduce them to the fine art of spitting cherry pits off the back deck and into the yard. It's wise to wear shoes in our backyard during cherry season, because some of the pits inevitably land on the walkway between the herb garden and the top of the hill. You don't want to step on cherry pits with bare feet. They're pointy. So take this as fair warning that you will see cherry recipes popping up here for the next month or two. Get ready - you'll want to make every single one. Arm yourself with this Oxo Good Grips Cherry Pitter ; it's the best $12.61 you'll ever spend. There's also the Leifheit Cherrymat Cherry Stoner with Container at $29.99 for larger quantities, but I've heard this style misses some pits, so I stick with the hand-held. It's slower but thorough.